Lasts up to 6 weeks. True color formula. Targets only gray for a natural look. 5 Easy minutes. The world's leader in men's haircolor. 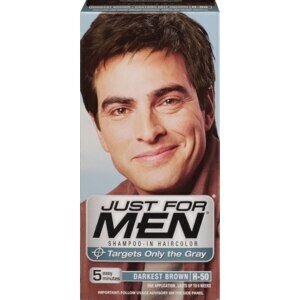 Looks Natural: Just for Men targets only the gray hair. Replaces it with subtle tones that match your natural hair color. Easy as Shampooing: No-drip formula works in 5 easy minutes. Rejuvenates Hair: Vitamin-enriched. Leaves hair thicker and fuller-looking. Ammonia-free formula won't damage hair. Lasts Up to Six Weeks: Lasts until the gray grows back. Can't-Miss Color: Just for Men comes in 11 natural-looking shades. So, it's easy to find one that truly matches your natural hair color. Can't decide between two shades? Try the lighter one first. You can always go darker later. 2005 Winner: Men's Health Grooming Awards. Made in USA. Water, Ethoxydiglycol, C11-15 Pareth-3, Vegetable Fatty Acid, Ethanolamine, Oleyl Alcohol, Fragrance, Sodium Sulfite, Erythorbic Acid, Trisodium EDTA, Polyquaternium-22, Panthenol, Tocopheryl Acetate, Aloe Vera Extract, Chamomile Extract, P-Phenylenediamine, P-Aminophenol, M-Aminophenol, N,N-BIS(2-Hydroxyethyl)-P-Phenylenediamine Sulfate, Resorcinol, 1-Naphthol, 4-Chlororesorcinol, 2-Amino-4-Hydroxyethylaminoanisole Sulfate, Phenyl Methyl Pyrazolone. Color Developer: Water, Hydrogen Peroxide. This product contains ingredients which may cause skin irritation on certain individuals and a preliminary test according to accompanying directions should first be made. This product must not be used for dyeing the eyelashes or eyebrows - to do so may cause blindness. Do not use if you have skin depigmentation problems such as white patches on your skin (a condition called Vitiligo), or if you have a family history of skin depigmentation problems, as an allergic reaction or skin irritation may cause loss of skin pigment.